Square in profile, the Lakeland Terrier has an elongated muzzle, and folded over ears. The tails are generally docked. Lakeland terriers look as though they are standing on their tip toes. Feisty and cheerful and loves attention. Lakeland Terriers originated in England. Lakeland Terriers are 14½ inches (36.8 cm). Lakeland Terrier males are 17 pounds (7.7 kg). Females are 15 pounds (6.8 kg). Lakeland Terriers come in black, black & tan, reddish, red grizzle, wheat, liver & blue, grizzle, and grizzle & tan and mahogany. The Lakeland Terrier has a protective wiry coat which must be hand plucked three times a year. Lakeland Terriers shed little to no hair. Confident and willing the Lakeland Terrier loves children. This breed can be a barker, a digger and may guard its toys. Lakeland Terriers get along with other dogs but should be taught not to chase cats at a young age. Feisty and cheerful, the Lakeland Terrier loves to be the center of his owner's life. Generally not subject to hereditary afflictions, the Lakeland terrier is a hardy breed. 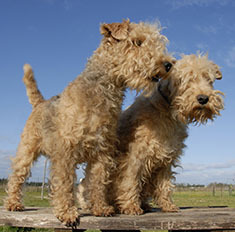 Lakeland Terriers live for about 10-12 years, some for as long as 16. Lakeland Terriers love to play catch and enjoy agility games. They do well living in an apartment and do not require a yard, however they are active and should be allowed to romp and play off their lead in a safe enclosed space. 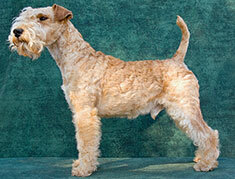 Lakeland Terriers are in the Terrier Group. Find Lakeland Terrier Puppies with our Free Breeder search!